The London Symphony Orchestra is one of Classic FM's partner orchestras. 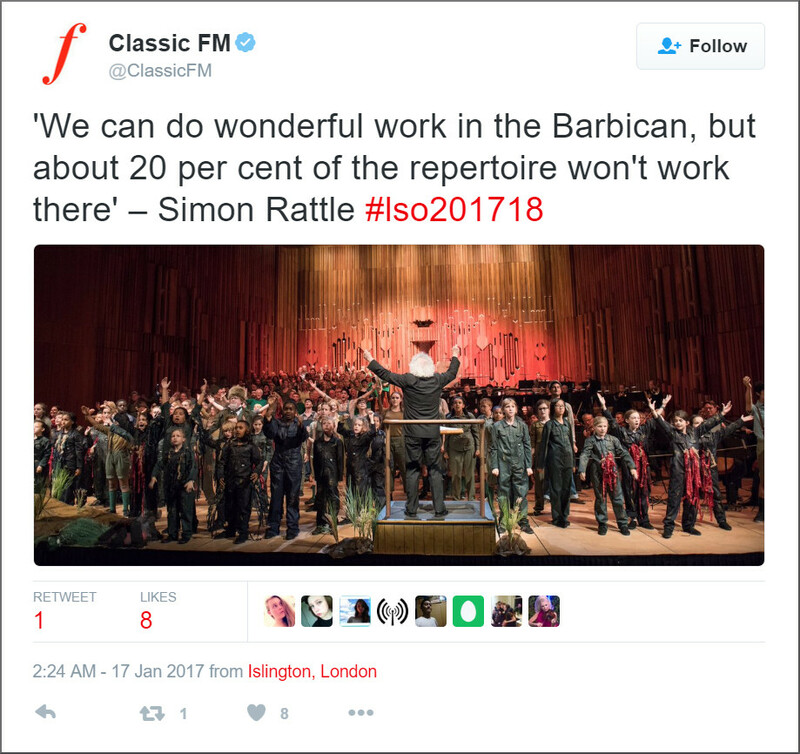 There has been much media spin linked to Simon Rattle's 2017 Barbican concerts as the LSO's incoming music director. 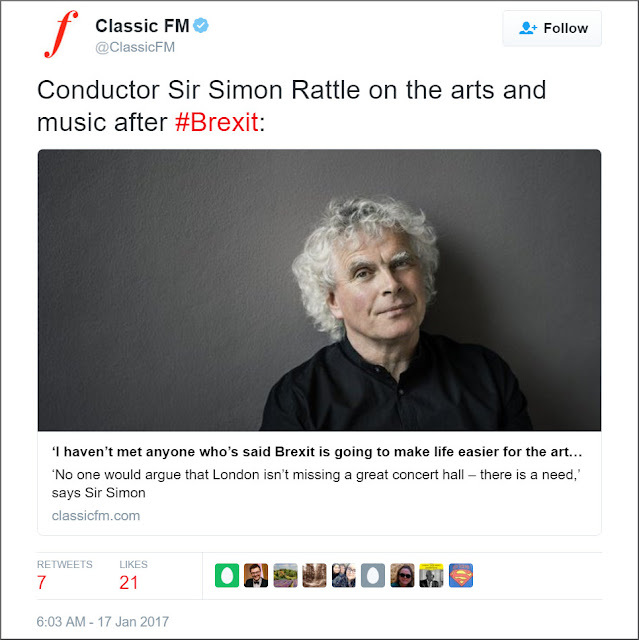 The spin includes a shower of anti-Brexit and pro-new London concert hall tweets from Classic FM quoting him, and a news story that "Simon Rattle launches first LSO season with swipe at Brexit". Both the Barbican Hall and proposed new London Hall are in the City of London, and the financial community in the City of London has been one of the most vocal critics of Brexit. In another Classic FM news item critical of Brexit, policy chairman of the City of London Corporation Mark Boleat is quoted as saying: "Britain has long been a magnet for global talent. To continue the sector's success, with 12% of City workers made up of European staff, it is important the flow of leading talent to the UK continues". As pointed out in a 2015 Overgrown Path post Mark Boleat is in favour of the new £278 million+ London concert hall. He is a member of the City of London Culture, Heritage and Libraries Committee, and with Michael Cassidy sits on the City of London Property Investment Board. From 2000-2003 Michael Cassidy was chairman of the Barbican Arts Centre, and is currently non-executive chairman of Askonas Holt; which is the agency that manages Rattle and represents the LSO. The recently announced £2.5 million of funding for preparing a detailed business case aimed at keeping plans for the new London concert hall advocated by Rattle alive was approved by the City of London Corporation’s Court of Common Council of which Michael Cassidy is a member. As well being a member of the City of London Corporation’s Court of Common Council and Property Investment Board, Askonas Holt non-executive chairman Michael Cassidy also sits on the City of London Investment Committee and Markets Committee, and is a non-executive director of Swiss global financial services company UBS which is a vocal critic of Brexit. Among the many sponsors of the London Symphony Orchestra is UBS. Simon Rattle argues that he has not met anyone who has said Brexit is going to make life easier for the arts. Which may well be true. But it can also be argued that with or without Brexit, the hegemony over classical music that he is party to will not make life easier for the very many fine musicians who are not fortunate enough to share with him membership of a disturbingly powerful and privileged London-centric club. Any copyrighted material is included for critical analysis, and will be removed at the request of copyright owner(s). Also on Facebook and Twitter. I find it strange that so many ostensibly well-educated people think that the world consists of a trading bloc of 28 countries. I would be keen to learn how Rattle thinks that leaving the EU will change the formalities required to travel to, say, the USA or Ruissia. Graeme, or indeed to the current honeypots for celebrity orchestras, the Gulf States and China - the LSO visits the latter country in February. Looking at the carefully orchestrated - pun intended - media exposure given to Rattle and his anti-Brexit message in the last few days leads me to the generous conclusion that he has naively allowed himself to be a pawn in a politico-economic game which does neither him, nor classical music, nor the case for remaining in the EU any favours. This post consists of a strange mix of innuendo and anti-elitism. There is no hidden agenda here - of course these people are going oppose Brexit since it will make their lives harder. And you can hardly blame them for doing it in a public manner. But the power of such small, privileged coteries over the classical music industry is hardly a new phenomenon; nor is Holt's the only such circle. And while I'm convinced that such power structures are at the root of the industry's troubles, it doesn't take away their right to voice an opinion, nor does it make doing so a conspiracy. And speaking of innuendo, at this point in time the terms of Brexit are unknown, as are its implications on the visa process for musicians. But that has not stopped Simon Rattle saying in an interview about the post-Brexit visa process "People simply don’t know how complicated it’s going to be". But it certainly won't get easier. Ilja, and in the absence of any facts about post-Brexit border policies your comment is also, of course, innuendo. And as we have now reached the point of the debate about this specific point becoming a typically circular and unproductive online argument we will leave it there. Thank you for your contribution.